You are here: Home » Features, News » Updated: Balloon recovered! Mt. Blue High School biology student, Thomas Wing, holds the weather balloon steady as it's inflated for launch on Thursday morning. Update 1:04 p.m. Monday: "Dr. Rick Eason and one of his undergraduate students drove to the north and west of Fredericton, NB on Thursday and recovered the payload. It was found on the ground just a few feet from a body of water. The balloon reached an altitude of approximately 96,000 feet over the course of its 3 hour, 12 minute ascent, taking just 42 minutes to descend. FARMINGTON - There was a countdown to launch and a successful lift off of a weather balloon by Mt. Blue High School students this morning that is expected to fly up to a cruising altitude of 100,000 feet and, thanks to today's high upper level winds, may land somewhere in New Brunswick, Canada. Riding along with Thursday morning's launch is a payload of experiments designed by three classes of curious biology students. 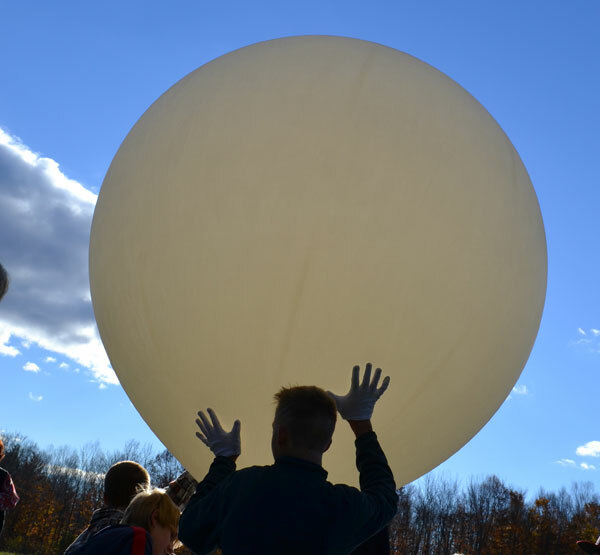 Weather balloon launches began a few years ago as part of a unique program designed to provide high school students with access to equipment previously left in the hands of government agencies and advanced college programs. 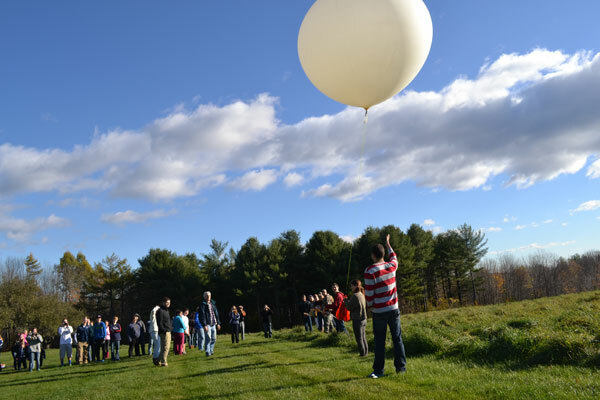 Three schools participated in the Astro-Scientific Ballooning Pilot Project, financed by the Maine Space Grant Consortium through a NASA Cooperative Agreement award. Mt. 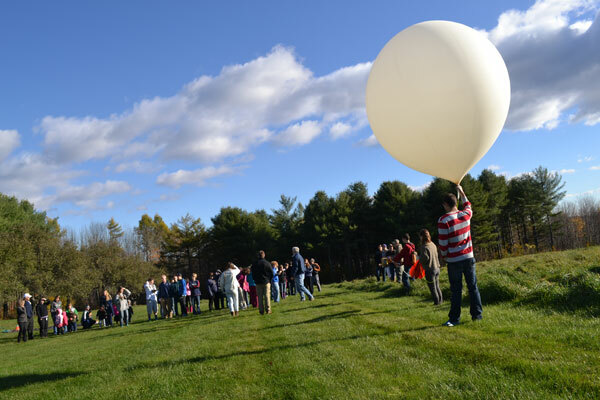 Blue High School biology teacher Doug Hodum and his classes have forged a partnership with University of Maine engineering professor Rick Eason in a series of balloon launches. The grant came to an end last year, but Hodum wanted to continue it and so did his students. "I wanted to keep the program going so I called Rick (Eason) and said 'how about a launch?'" Hodum said. Eason replied he's been looking for another reason to do a launch. 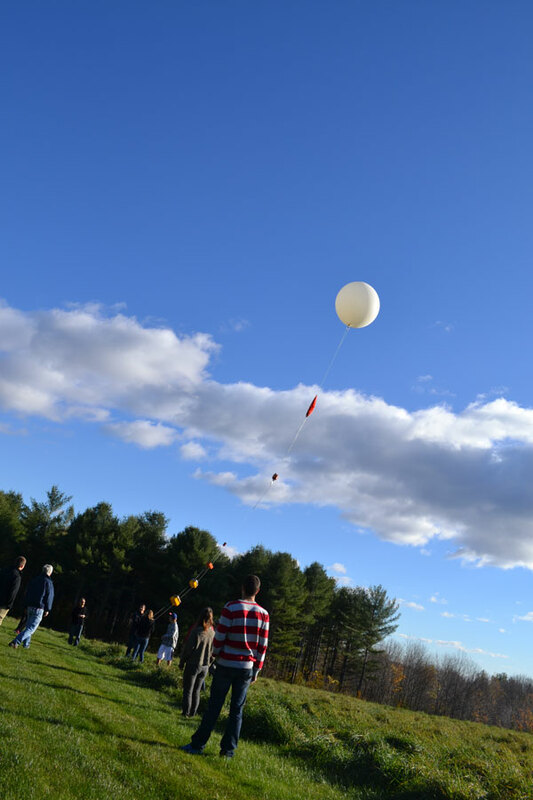 Three of Hodum's classes wanted to take part in a launch and designed a variety of experiments on items included in the balloon's payload. Students are interested in finding out the effects of high altitude, extreme temperatures and ultraviolet light on chive, radish and bean seeds. Bread and yeast samples will also be subjected to the balloon's flight and subsequent study. With a GPS tracking system part of the payload, Eason and Hodum took off in their cars after the balloon launch and will follow it until it bursts and brings its payload back down to Earth. "We've never lost a payload," Hodum said. 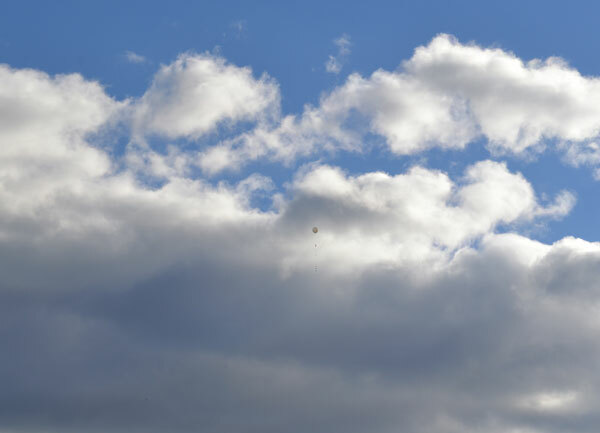 The farthest a balloon has traveled from its Farmington launch is Milford, near Old Town. Today was going to be much different due to high upper level winds. The balloon is expected to travel up to 20 miles in elevation before bursting and with the high winds it's anticipated it may be carried northeast, all the way to New Brunswick. Eason packed a passport with an eye towards needing to cross into Canada to retrieve the balloon's payload. It's not always easy retrieving a payload and that's why Eason carries an expandable pole and is good at climbing trees. Once the payload is returned, the students' own scientific methodology and hypotheses will be put to the test. "It will all be put to use and gives the students real experience," Hodum said. Mt. 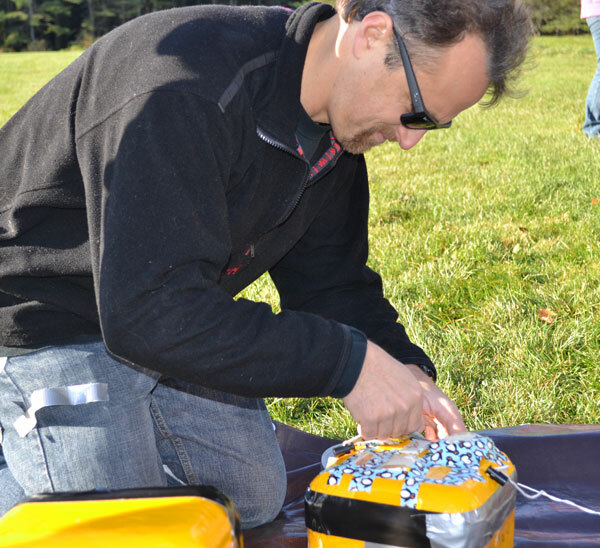 Blue Campus teacher Doug Hodum attaches seeds to the balloon's payload. Students are testing the effects of high altitude, extreme temperatures and ultraviolet light on a variety of items. Hopefully the balloon is retrieved, along with its payload so students can conduct the experiments they designed in class. 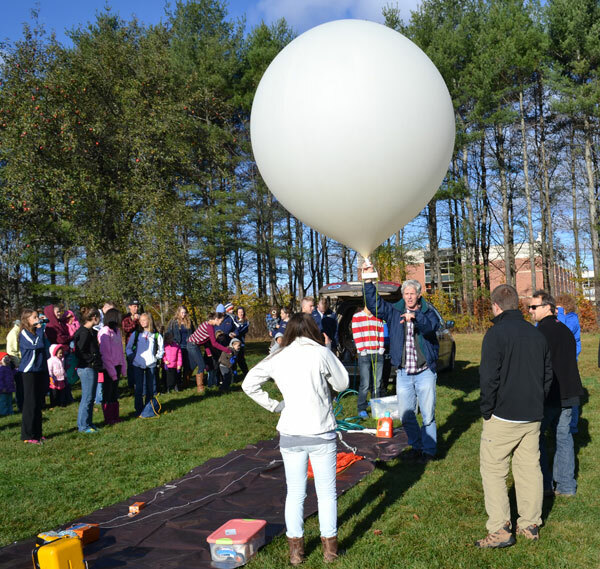 Rick Eason, University of Maine engineering professor, holds up the weather balloon as he gives launch instruction to the students. 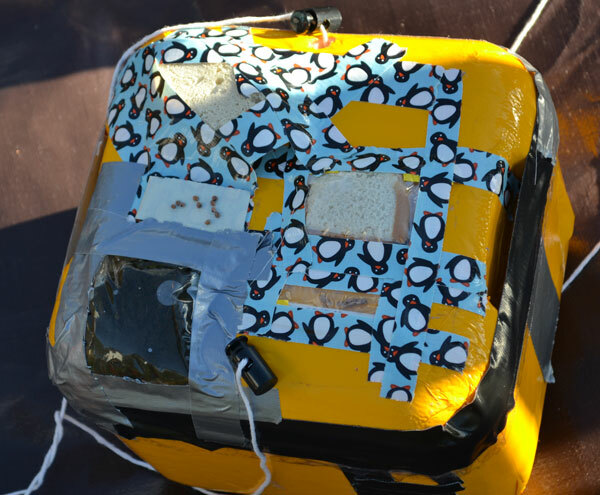 Seeds, bread, and more are taped securely onto a foam block, which will travel by balloon across Maine and possibly into Canada. 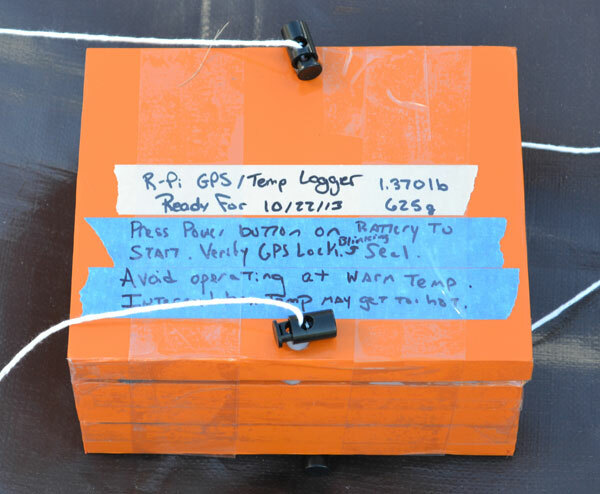 Recorders and a GPS tracking system are key to finding the balloon once it bursts. Mt. Blue High School biology student Alex Gilbert holds the balloon as students countdown towards launch. Alex Gilbert lets go and the balloon rises, carrying its payload. 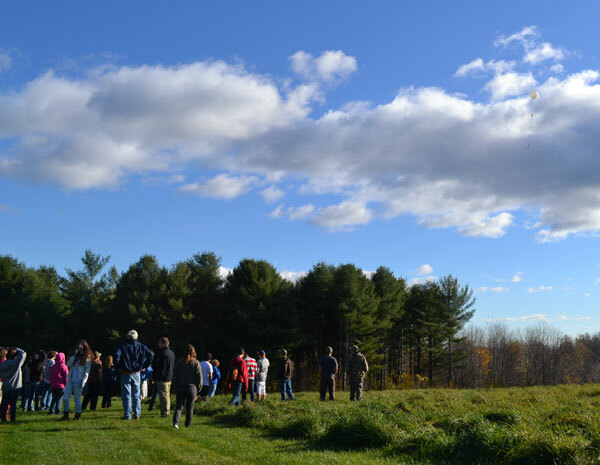 Students watch the balloon, at right, head up into the clouds. The balloon is expected to fly up to 100,000 feet or 20 miles up in elevation.